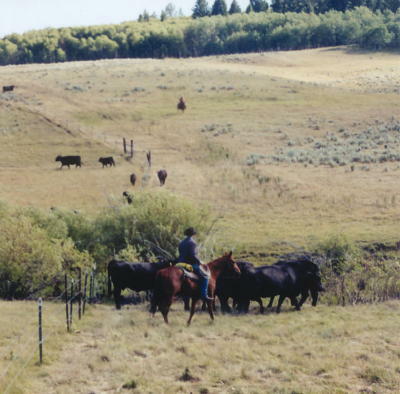 "A Real Working Cattle Ranch"
The Ideal Horseback Riding Adventure! "Join us for an authentic horseback riding vacation of a lifetime on a Real Montana Working Cattle Ranch!" Since the release of movies such as City Slickers and Lonesome Dove the appeal of the American West, riding horses, wide open spaces, herds of cattle, and western life-styles have become increasingly popular. While many travelers are satisfied with illusory depictions of life in the West in the form of 'Dude' ranches with their swimming pools and plodding trail rides, we provide the adventurous traveler the opportunity to experience the real West on a 5th generation "Working Cattle Ranch." Flynn Ranch Vacations are Unique! Your hosts will guide and instruct you on every aspect of operating, living on, and enjoying a 1000 cow/calf, 22,000 acre cattle ranch. Well broke mountain trained horses - No "nose to tail" riding! Within easy driving distance to Yellowstone and Glacier National Parks! Unlimited opportunities to view wildlife and take photographs! Cattle Drives! 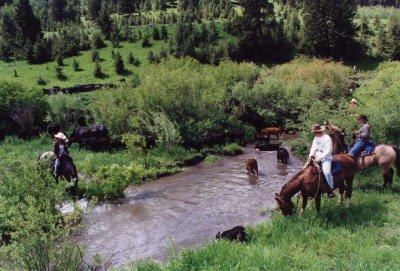 Flynn Ranch Vacations is offering three authentic cattle drives. Only 12 guests are accepted per week, 18 years or older, intermediate or better riders required. This will be a real "kick in the pants" horseback riding adventure! � Guest Capacity 6 per week - may be exceptions depending on circumstances. � Click on the photo below to see a typical view of Flynn Ranch scenery. "Once you've gotten off the beaten track and experienced the solitude and peace of the Flynn Ranch you won't settle for less."